Few singers have been such a tantalizing absence as Dame Sarah Connolly. 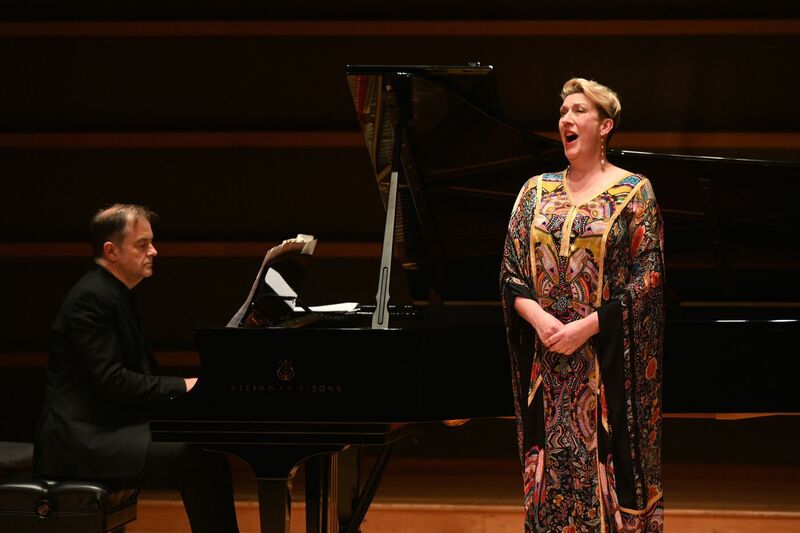 Now at the peak of her career in London, the British mezzo-soprano records extensively (Mahler’s Das Lied Von der Erde with Yannick Nezet-Seguin), stars in Dido and Aeneas on video from the Royal Opera House and just last weekend had a Wigmore Hall recital seen on a live video stream. Yet her Philadelphia Chamber Music Society recital on Friday at the Kimmel Center — her only U.S. appearance this season — was a far richer experience than what can be captured on any high-tech relay medium. All of the expected elements were there: She was in fine voice (her mezzo soprano recalling the great Christa Ludwig), with her minimal-gestures physical appearance making you focus exclusively on the music — and in offbeat repertoire that only an intelligent singer with great vocal equipment can truly put across. What emerged during the program of Johannes Brahms, Hugo Wolf, Albert Roussel, Claude Debussy, and Alexander Zemlinsky — none of it easy stuff — was the kind of vocal and interpretive precision that allows you to follow the music, one creative choice at a time. The audience’s emotional empathy was summoned often by Connolly’s vocal details. When the words mentioned a shiver, so did her voice for a second or two. Her voice grew pale and vibrato-less when characterizing supernatural matters. Such effects were so well-integrated into the music that they didn’t seem like effects at all, but just the way the music was supposed to be. Such gifts are ideal for music as complex and dramatically eventful as that by Wolf, the greatest of all German art-song composers. Her five-song Wolf set, which dominated the recital, started with simple, open-hearted “Even Little Things Can Delight Us,” which celebrates the beauty of miniature objects but hardly stops there. Exploring the song’s subtext, Connolly and pianist Julius Drake found that the music’s surface delight also had simultaneous undertones of lament — in anticipation of how such precious things often leave us. Elsewhere in the Wolf songs, extremes of exaltation and despair were expressed with what felt like impulsive outbursts. Wolf’s unleashed emotions were all the more vivid alongside the Brahms selections that came before, in which emotional content was contained in tidy, traditional forms. The concert’s second half featured a quartet of songs by Roussel and Debussy’s Trois Chansons de Bilitis, using outdoor natural phenomena and ancient mythology as a window into their inner lives. Even with pianist Drake in somewhat low-key form, what was below the surface of these songs all but came to the musical foreground. Zemlinsky’s Six Maeterlinck Songs created a meeting point between the German and French halves of the concert: Words by Belgian symbolist poet Maeterlinck were often dream-like parables — full of people who are lost, wearing golden blindfolds, or nonchalantly search for death — to which Zemlinsky responded with the musically sprawling Wolf treatment. The composer wasn’t always confident about how to handle all of this, but through their great concentration, Connolly and Drake carried you through the music’s not-fully realized moments. The Philadelphia Chamber Music Society audience clearly knew what a special experience that it had. But in the encores -- English songs by Herbert Howells and Dominic Muldowney — Connolly showed that she’s much more compelling when singing in her native language. Might there be more of that on her next visit?